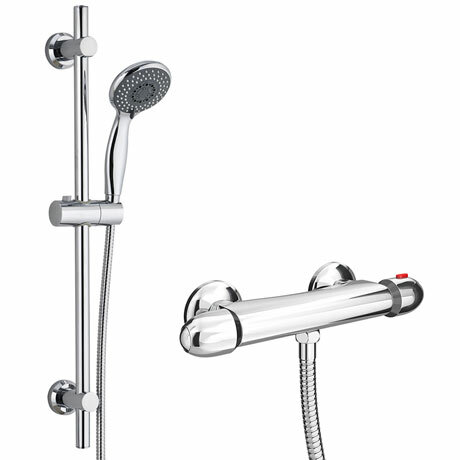 Featuring a contemporary rounded design, the stunning Juno thermostatic bar shower valve with slide rail kit is designed and manufactured using the finest methods and materials to ensure a high quality product. With it's contemporary styling the Juno shower will naturally blend in to and compliment any modern bathroom. Our state of the art thermostatic showers ensure that you will enjoy your shower at your desired temperature regardless of any other running water in the home. The valve is pre-set to a safe and optimal 38°C, this can be easily offset by holding down the safety push and click button on the handle. The multi-function shower head allows several pressure streams for those who want the power shower effect one morning and and a wider spread burst the next. Q. Is this adjustable to fit 140mm pipe centres? Hi Steve, the pipes have a 20mm adjustment. Hope this helps! Seems good quality for the price. Great product and value. Love the choice of spray. Shower hotter than when last shower was new. Works well. End of thermstat bar plastic tacky but shower within my budget. 10 year warranty can ask for parts if goes wrong. Functions better than previous installation in new build. Overheat protection. "Brilliant, I was worried about the bar for the price. But I can say its better than the old one which cost a double the price of the Cruze. It took about 20 mins to swap over. The Thermostatic part works well and now can have a shower with out keep adjusting the temperature. And it looks nice." We have used you for a few things and have never had a problem. Looks good and works very well. For the price I wasn't expecting too much however was more than pleasantly surprised. Quality is top notch and it feels solid and well made. Fitting was a breeze and took about 20 minutes which included removing the old mixer.Will be ordering another when I get round to upgrading the main bathroom.Delivery was quick too, despite choosing the cheapest service I received it the very next working day. Nice item for the price. The hose is not the best but for the price something has to give. Excellent product, fantastic price and super fast delivery. Very impressed. Will definitely use Victorian plumbing again. Have already recommended to friends. Thank you.